After visiting Eleven Eleven Mississippi last month, the lovely wife and I wanted to try its sister restaurant just down the street before the Symphony on Saturday night. After our experience there, I believe that Vin de Set is the one of the pair that I feel I’d be most likely to visit again. Not that there was anything wrong with Eleven Eleven, I just loved Vin de Set that much more. If I were to choose one word to describe Vin de Set, it would be cozy. The main dining room was warm and inviting with the exposed brick walls, and soft but sufficient lighting. Also, there was a more relaxed feel to Vin de Set. I loved the open kitchen at Eleven Eleven, but at the same time, that adds to the noise and overall bustle of a restaurant. Vin de Set was a bit quieter. We had a very pleasant evening of conversation. I am no francophile. However, I have slowly began to appreciate French food. I even enjoyed what I had always believed to be the most overrated French food of all time, the crepe. My disdain for crepes stems from a bad experience I had in Paris with an overpriced dessert crepe. I have always considered them to be a glorified pancake…and a really thin, tasteless one at that. 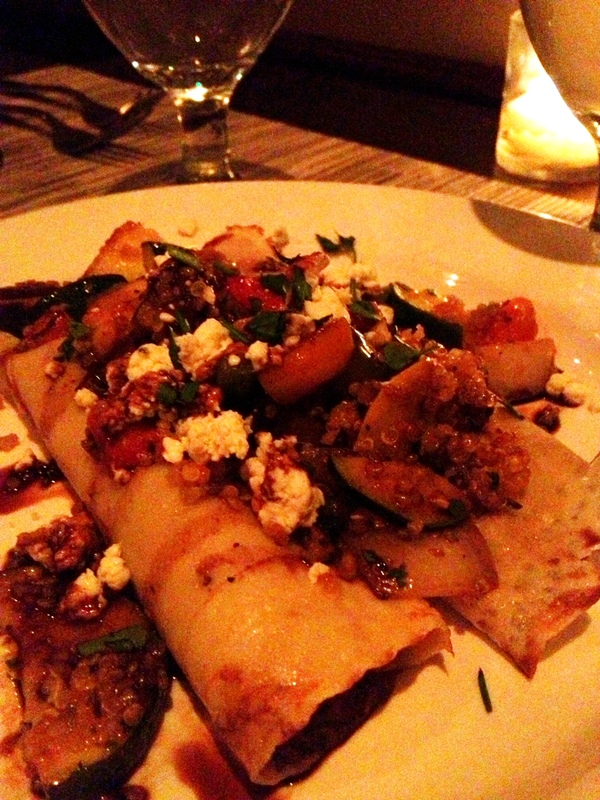 However, the lovely wife wanted to order the ratatouille crepe as an appetizer, and I went along. It was an outstanding, light appetizer filled with traditional ratatouille vegetables, quinoa*, Boursin cheese, and topped with a balsamic glaze. 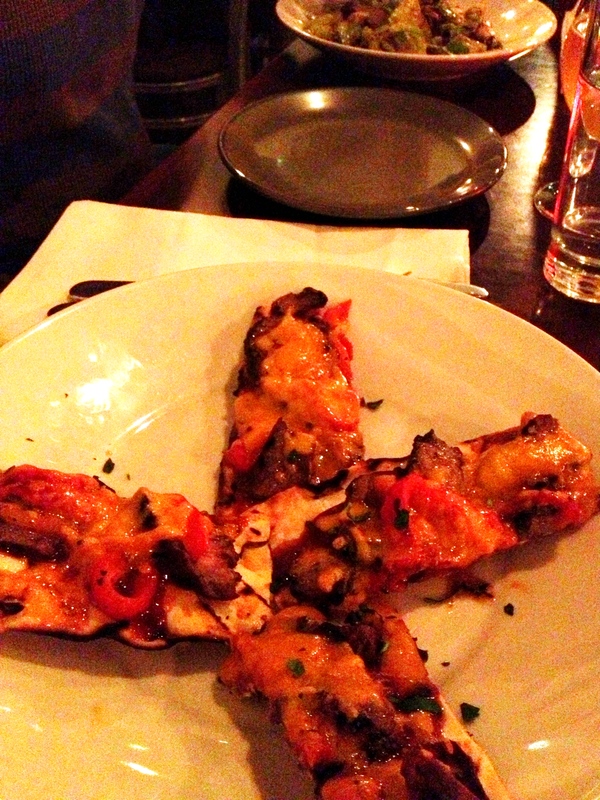 We split the appetizer, and I found it to be a wonderful light appetizer to start our meal. Although I thought it was the vegetables that carried the dish, I have to say, the crepe brought body and structure to the whole appetizer. *Quinoa, pronounced KEEN-wah, is the reigning king grains. As a matter of fact, did you know that this is the INTERNATIONAL YEAR OF QUINOA??? Lo and behold, the United Nations General Assembly has declared 2013 the INTERNATIONAL YEAR OF QUINOA. It is nice that the nations of the world can agree on some things. ALL HAIL QUINOA, THE BOLIVIAN WONDER GRAIN! I ordered one of the specials that evening, rolled veal cutlets wrapped with ham and gruyere cheese, lightly breaded and fried. They were topped with Meyer lemon juice, and served with barley and broccolini. The dish was marvelous. 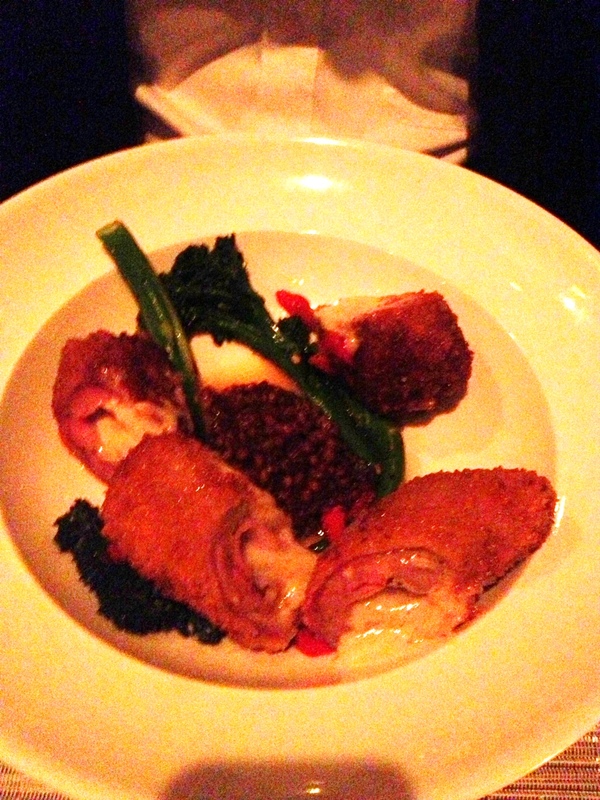 The breading was light, and the gruyere and ham melded with the veal to create moist layers of meaty goodness. The barley side dish was excellent as well. The lovely wife had a half game hen with a house-made sausage and duck confit cassoulet. She raved over the game hen, but in her opinion, the duck-confit cassoulet was the real star. The white beans were enhanced by the duck fat and was her favorite part of the whole dish. The only downer was the house-made sausage, which we both found to be bland. But, overall the dish was a real hit. All in all, our server was excellent, checking on us frequently before, during, and after our meal. He was even prompt with the check as we needed to be getting off to the symphony. I personally can’t wait to go late in spring or summer to enjoy the outdoor seating and view of downtown St. Louis. However, it is not the view that makes Vin de Set worth visiting. It is a warm welcome, pleasant service, and great food that makes the restaurant. The view just happens to be the icing on the crepe…I mean cake. I am now highly intrigued by Argentinian cuisine. I tried their national sandwich earlier this year, and have now experienced their sauce. It is a miracle these people are physically capable of leaving their homes, because if I lived in Argentina, I don’t think I’d fit out my door. Maybe all the tangoing keeps them fit. I bought two flank steaks a while back at Costco, and I was looking for a different way to prepare the second one. 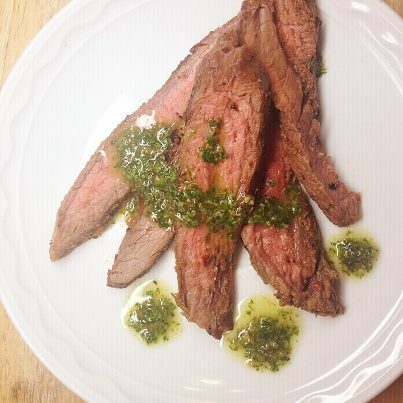 Anyway, I saw a recipe a while back for flank steak with chimichurri on Weight Watchers. Unfortunately, I did not follow their serving guidelines or healthy recipe Saturday evening. Three quick thoughts on this delightful sauce. 1. I cannot think of a better use for parsley. Whenever I buy a bunch of parsley in the store, I always think, “Well 90% of this is going to be garbage.” Which totally stinks. I used nearly the whole bunch in this recipe, and I’ll use the rest on a roast this week. 2. No one seems to know exactly where the name for this sauce came from, or what it means. There are several theories, but no one seems sure which is correct. I’m always interested in the etymology of different foods, and this one seems to be one of those mysterious dishes that no one can quite explain the name. 3. I totally love my immersion blender. They give you this cup with the blender, and I used it tonight for the sauce. It worked perfectly. If the good people at Cuisinart would like to sponsor me, I’d be completely up for that. 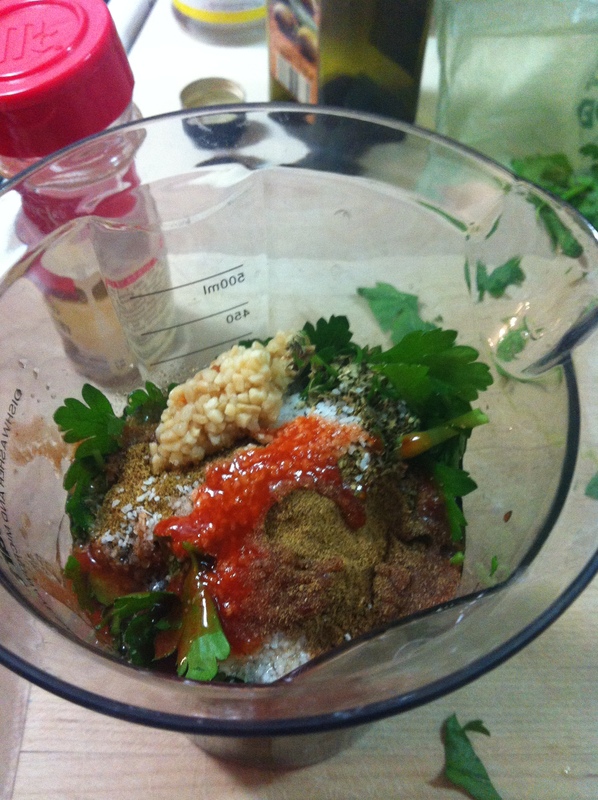 I’LL BLEND ANYTHING! That could be a new blog: Will it Blend? 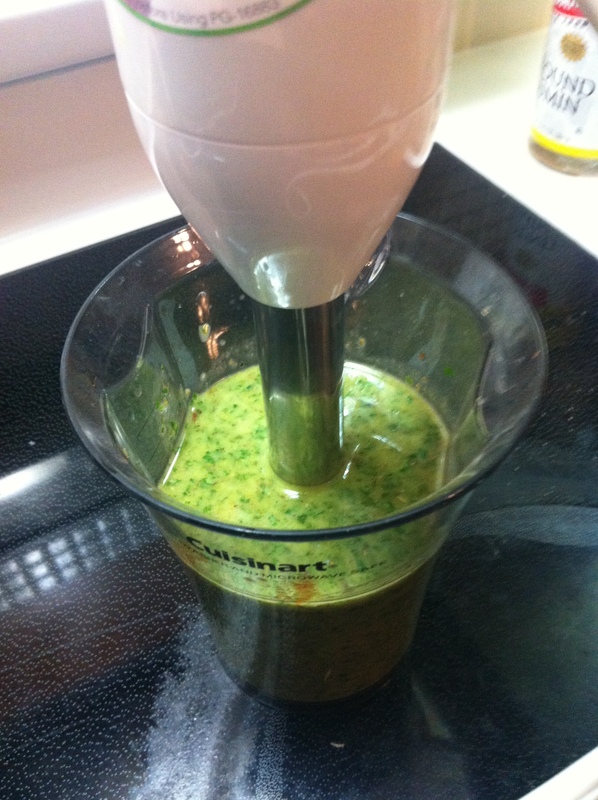 Anyway, I certainly won’t take credit for the chimichurri recipe, so here’s the link to the one I used. 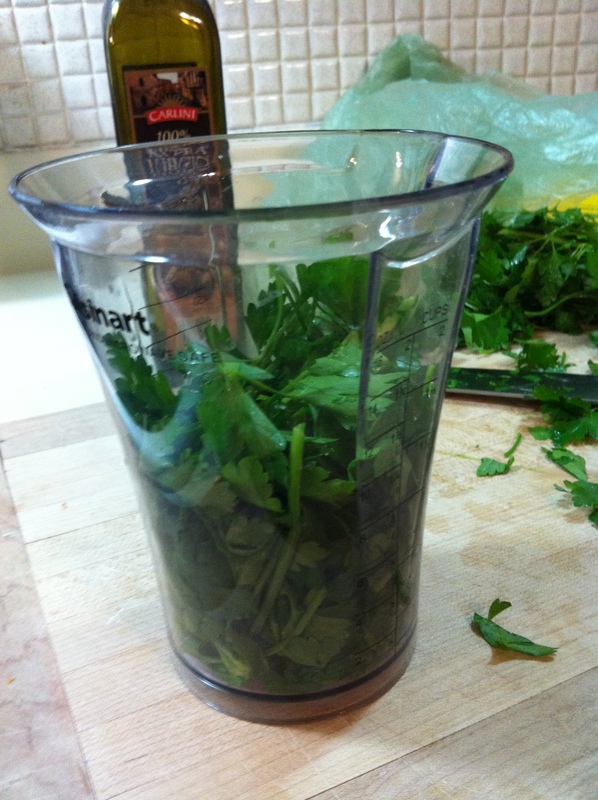 Roughly chop the parsley and put in your blender/immersion blender wonder bowl. GO TO TOWN WITH IMMERSION BLENDER. (Or use your regular blender/food processor) I think this took ten seconds. Serve over the steak of your choice. Try not to eat all the steak. One final note. We had leftover chimichurri sauce that we put in ice cube trays and froze. I’m going to use these bricks of frozen Latin American flavor to marinate some future steaks. Last night I was wrapping up dinner with the kiddos and Sarah came into the kitchen to inform us that Stan Musial had died. The wonderful daughter was sad for a bit. 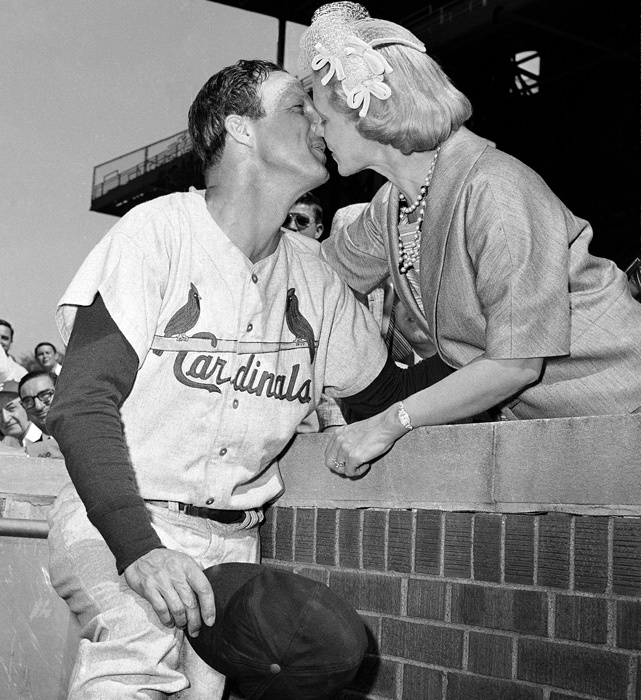 She knew that Stan was a great Cardinal. The delightful son was sad since anyone dying is a sad event. Of course, the kiddos got over it quickly as dinner was cleared and they went on to wrestle each other in the living room. My sadness lingered throughout the evening as I surfed the web looking at articles and tributes to The Man. As I walked to church this morning, I noticed the title of the sermon for today was “Living with Dying.” And of course, the first thing Pastor talked about this morning was the death of Stan, and how even in death Stan provided an example for others to follow, dying at home surrounded by family and friends. He even talked about how Stan Musial had affected his life, learning how to hit as an eight year old from a album entitled Stan the Man’s Hit Record. After church, I talked with a friend of mine about how we reacted to the news last night. All this for a man none of us had ever met. I find it telling that so many are mourning a man who many today never saw play, and most never met. It’s a testament to a life well lived. As you search the web and look at all the tributes to Stan, the thing that is most telling today is that the focus of many articles is not his playing career, but his graciousness and decency. In today’s world, graciousness and decency is seemingly so uncommon that it is deemed newsworthy. Graciousness and decency are certainly in short supply today. What a contrast Stan Musial’s life provides during a week that saw Lance Armstrong DECIDE that he would publicly confess his years of deception and wrongful lawsuits in a self-serving spectacle hosted by Oprah Winfrey. Essentlially entertainment, funded by ad revenue, Lance flippantly acknowledged he lied and ruined people’s lives in a selfish attempt to keep himself publicly relevant. Manti Te’o’s touching story of overcoming hardship was exposed as a fraud this week as well. Here’s what I found disturbing about his story. The knot of lies surrounding this story is so large, I doubt it will ever be untangled. I find it interesting that his university knew about this for about three weeks, hushed it up, and now this young man is letting a Christian institution of higher learning lie for him as well. He too decided make his contrition public, in an attempt to maintain his status as a first round pick in the NFL draft. These guys have been in the public sphere for a short time, and will live the rest of their lives under a cloud of scandal. Stan Musial lived life in the public eye for 72 years and to my knowledge never had a TV special where he had to explain or justify his actions. He led a life that is worthy of emulation, and upon his death, celebration. With that said, here’s six thoughts on what made Stan “The Man”. 1. He loved his woman well. Stan and Lillian were married for 71 years. 71 YEARS! The lovely wife and I have been married for 12, and in today’s modern world that is fairly impressive. Lillian was his first and only love. They got married out of high school and from all accounts, they had a strong and loving marriage. Sadly, Lil (as she was known) passed away last May. At the time, I commented to my lovely wife, that Stan would not live another year. For providing an example of a strong marriage, Stan was the man. 2. Stan was kind. The stories of his kindness are numerous, but one I always enjoyed this one. He bought a house for one of his old minor league coaches who had fallen on hard times later in his life. The coach had housed Stan and Lil during his time in the minor leagues, and Stan repaid the favor later. For his kindness, Stan was the man. 3. Stan was a hard worker. He continued working in his office into his late eighties, signing autographs and fulfilling other’s requests. During his early years as a ballplayer, he spent his off-seasons working in a factory. Finally, to be that successful at the major league level required a large amount of work to keep yourself in peak shape for 22 years. For his work ethic, Stan was the man. 4. Stan cared about kids. He never smoked in public because he was afraid of the example it would set for kids. He signed countless autographs through the years and one of the main charities he supported was Covenant House, an organization that provides services for homeless and at-risk youth. For his concern for kids, Stan was the man. 5. Stan believed in fair play. He took a huge pay cut when he felt he didn’t live up to his contract late in his career. He never got ejected from a game. A national sportsmanship award is named in his honor. For his demeanor on the playing field, Stan was the man. 6. Stan was loyal. Loyal to his wife, to his friends, to his team, to his city. For his loyalty, Stan was the man. All in all, The Man was a difficult nickname to live up to. But, Stan deserved the nickname and all it stood for. Thanks Stan for providing us with an example of a full life well lived. So, with the remainder of this year, I’m going to try to emulate Stan as best I can. I’m going to love my wife, be kind, work hard, care for my students, treat others fairly, and exhibit loyalty to those around me. I doubt I’ll do it all the time, but it doesn’t hurt to try. Have a great day everyone. Spinach is the comeback kid of vegetables. I say this in the midst of the Kale Invasion. The other day I openly guffawed at someone mentioning making kale chips. I wondered how one made chips from kale. I was promptly put in my place, being told how to do it and how good they are. Now, I’ve had kale raw, and I’ve had it cooked, and I am not convinced this veggie has staying power in our food consciousness. I know it’s popular now, but it too will be put back in its leafy place, along with chard (which I do like better than kale), and other leafy also rans. Spinach on the other hand, has really climbed to the top of the vegetable heap. I thought of this the other day during a visit to Costco. Spinach is in EVERYTHING. On that particular day, you could sample spinach-artichoke dip, and these AWESOME veggie patties that contained spinach and garbanzo beans. Down in the frozen food aisle, there was frozen Spanakopita (Greek Spinach Pie). Finally, you could just buy a giant container of fresh baby spinach leaves, which I noticed had mostly sold out. I like to consider myself a trendsetter. I have LOVED spinach since I was a kid. 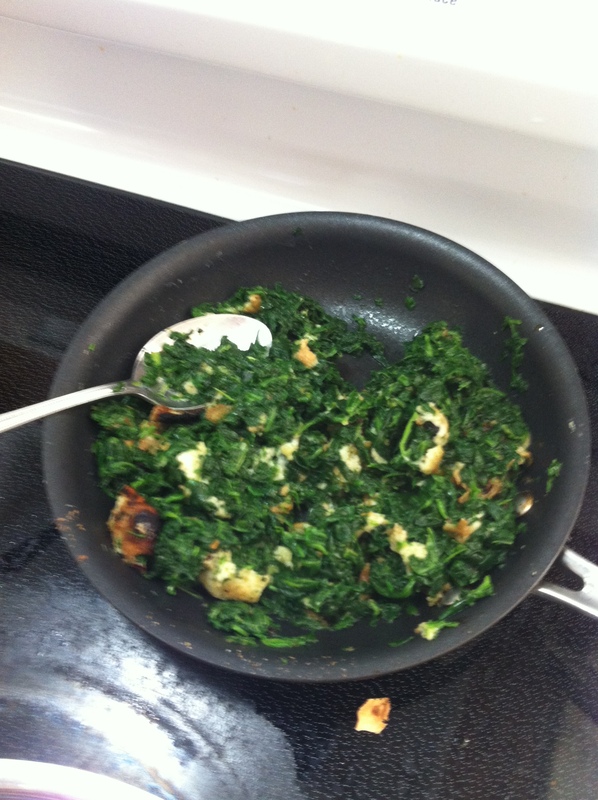 I have mentioned that my Grandma Toedebusch made fantastic spinach, and it was my go-to vegetable as a child. 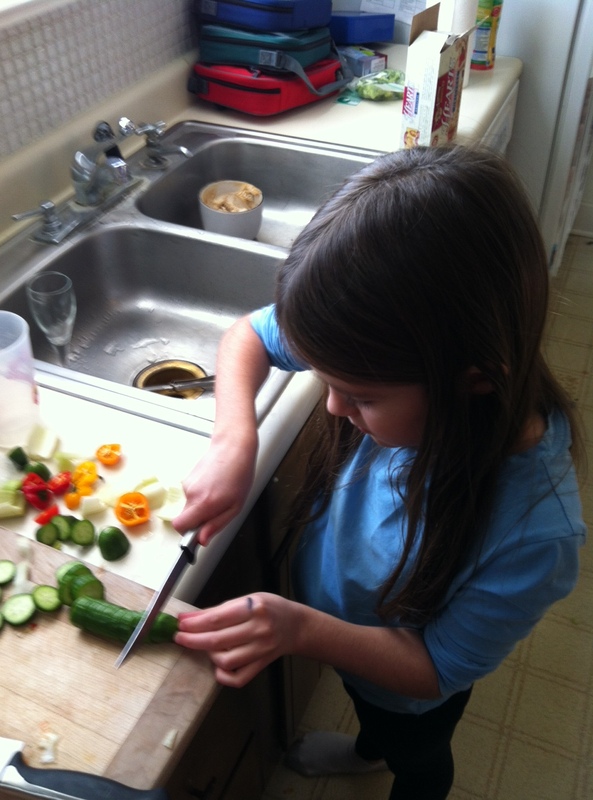 It was a rather lonely club I was in at the time, while other kiddos went for the carrots as their favorite veggie. Back in the 1980s, I don’t think spinach held the place it holds in our hearts today. If you think about it, spinach was a joke. Popeye* was the most famous spokesman for and he didn’t exactly put spinach into the best light. He’d be stuck in a corner as Olive Oyl was being assulted in some way by Bluto. Boom, a can of disgusting spinach would materialize, he’d pop it in his mouth and he’d become a raging hulk of vegetable fueled fury, pummeling those in his way. I also remember that his (kids? nephews?) hated spinach. Anyway, this was the best advertising spinach had. *I always wonder how Popeye got into the fried chicken business. Was he tired of vegetables? I’d love to see a cartoon of Popeye in a crisis, and instead of eating spinach and becoming a mega-ultra hero, he eats a bucket of fried chicken and takes a nap. Anyway, I don’t remember spinach being in much of anything other than spinach. Today, however, spinach has found its way into pizza, pasta, dips, and numerous other tasty treats. It took a while, but spinach has certainly has come a long way in the last few years. Well done, wonderful vegetable, well done. 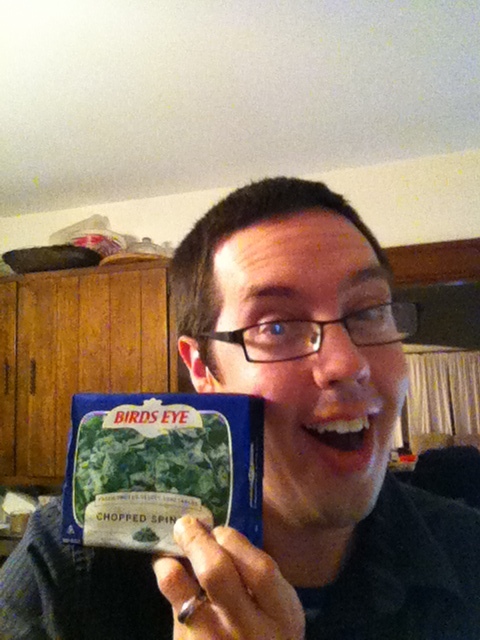 So, without further ado, I give you ten thoughts on spinach. 1. Spinach-Artichoke Dip is AMAZING. I could go through a whole Costco container in a single evening (did I hear a personal challenge?). It’s even better when it is homemade. 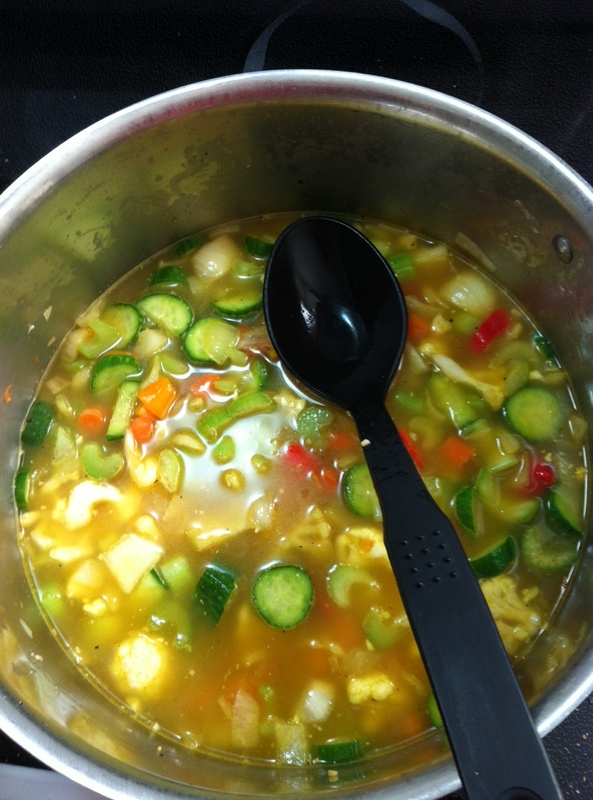 Here’s a link to an AWESOME recipe from a fellow blogger. 2. If spinach had a citizenship, it would be Iranian. According to food historians, this leafy green originated in Persia (modern day Iran). Spinach tends to keep this on the down low when dealing with TSA agents. 3. So do the Iranians make grow the most spinach of any country today? Um, no. China produces 85% of the world’s spinach…interestingly I’ve never had spinach in a Chinese restaurant. I suppose they are keeping it to themselves. Hooray for the USA! We’re number two! 4. I always like the word Superfood. Spinach is a superfood. It has 100% of your vitamins A and K*. It helps your eyes, heart, and colon…and if I’ve learned anything by listening to the radio, a healthy colon means a healthy you. Sadly, as with any super vegetable, it has it’s kryptonite. Healthy spinach hangs out with cheese and cream a little too often. Healthiness fading…deliciousness rising. *How did we name the vitamins? A, B, C, D, E, K. What happened to F-J? I should look into that. 6. WASH YOUR SPINACH! Spinach is a dirty pirate of vegetables. It is one of the more pesticide laden of vegetables, and you want to get that off your healthy goodness. Second, bacteria also find spinach delicious, resulting in a giant e-coli outbreak a few years back that sadly resulted in some fatalities. Today, when you see fresh spinach, it often says TRIPLE WASHED. That will continue until e-coli attacks again. Then we will see QUINTUPLE WASHED! 7. I love saag. Saag is Indian creamed spinach. I’ve never made it, but man, I go to town on that stuff at my two favorite Indian Restaurants. Copper Chimney and India Palace. 8. Spinach loves the cold. It is one of the hardiest vegetables, and is one of the first to come up in the spring. Last winter the spinach I planted in the fall of 2011 survived into 2012. Now, last year was a mild winter, but still…every other plant in the garden died over the winter. NOT SPINACH! Superfood indeed. 9. I love the spinach bricks in the frozen food section. Other vegetables do not have convenient sizes or shapes. Spinach will stack up for you in nice, neat piles. Not like those unruly bags of green beans and peas. I appreciate the efficiency of spinach. 10. Finally, my mom still makes my grandma’s recipe for spinach. It’s the best. If you’d like to find out how to make it, you’ll have to ask her. I’m sure she’d like to talk to you about it. *The kiddos loved Back to the Future. I find the 1989 vision of 2015 interesting. Pay phones and faxes are everywhere! However, we certainly could put some more R+D money into hover technology. A 2015 without hover boards and hover cars will be an incomplete future indeed. Furthermore, any OTHER movie with a plot involving time travel holds no interest to me if it does not conform to the laws of the space-time continuum, as set forth by Dr. Emmett Brown. As I was saying, we were out for lunch, and being back from Michigan with its plethora of Greek Coney Island restaurants, I was craving a gyro. In St. Charles, your choices are limited. However, Mario’s Donuts and Cafe is a nice place to get your Greek fix north of the Missouri River. The wonderful daughter had a Greek salad. It was enormous. First, the good…Plenty of lettuce. Next the bad…hardly any olives or cucumbers. There was a decent amount of tomatoes, but they still got lost in the mound of lettuce. The salad also contained chopped up pepperocini. This too was not to her liking. I had a few bites and thought it was ok, but not as good as the St. Louis Bread Company Greek Salad. I would not order it again. 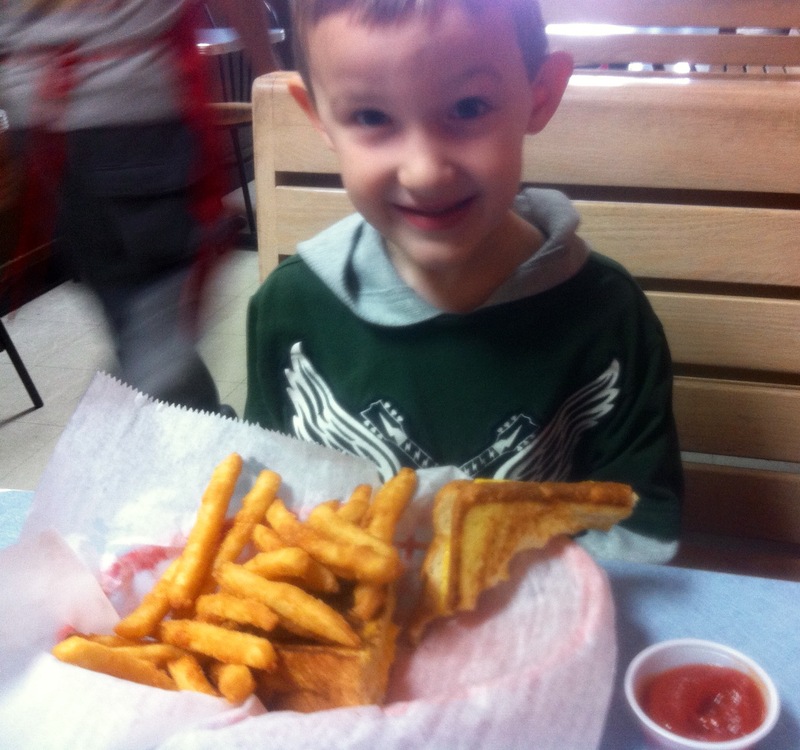 The delightful son had a grilled cheese sandwich. The boy has never met a grilled cheese he did not like, and I have to say, it did look appetizing with thick slices of bread and ample amount of melted cheese. I had the gyro. It was excellent. The pita bread was warm and soft, and contained a good amount of hot gyro meat. My pita contained a nice mix of lettuce, cucumber, red onions, and tomatoes. Finally, it was LIBERALLY coated with tzatziki sauce. Just the way I like it. However, we all agreed the real hit were the french fries. I’m not sure what they do to them, but it almost seems that the fries are dipped in some sort of extra batter before being fried. Hot, salty, crunchy on the outside, mushy on the inside, they were outstanding. The lovely daughter sneaked several off of my plate as well as the plate of her brother. Finally, I will say I have been here a couple of times, and have always found the service to be good. The gentlemen behind the counter called me boss or sir a couple of times, and I am a total sucker for that. We left the restaurant filled, fully fueled to say αντίο (goodbye) to 2012 and celebrate a new year full of good times and good food. *And neither am I. I just googled “curry cream of vegetable soup” and it is a thing. Apparently this is sort of how I thought I had invented legos as a child. To this day, I have no idea why I thought that. Regardless, I DID NOT use the great Internet Cookbook while making this on Wednesday afternoon. Basically, I had a fridge full of leftover veggies from a holiday party on December 28th, and needed to find a way to use them. However, the added challenge is how to get the delightful son to eat said vegetables. I think if he had his way he’d just eat baked beans and bread. He’s a classy little guy. Enter the Cuisinart immersion blender! It destroys all traces of possibly objectionable vegetables with a dull roar, creating a creamy smooth veil of hidden vegetable goodness. 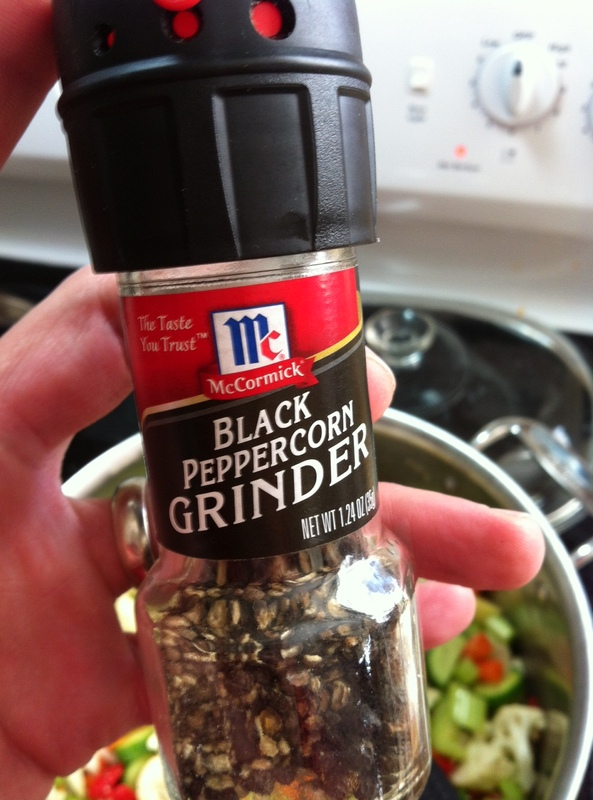 So, I was looking for something to season my soup, aside from copious amounts of garlic, salt, and pepper. Enter the curry powder. It was sitting in the back of the cupboard, all quiet and unopened. You may have noticed I love Indian food, and I thought vegetables+curry=South Asian Subcontinental goodness. That math totally added up. The curry was not overwhelming, but it added a nice color, subtle aroma, and slightly spicy flavor to the soup. Anyway, the lovely wife and I both really enjoyed the soup. The delightful son ate his bowl, and the wonderful daughter had a bowl and a half. 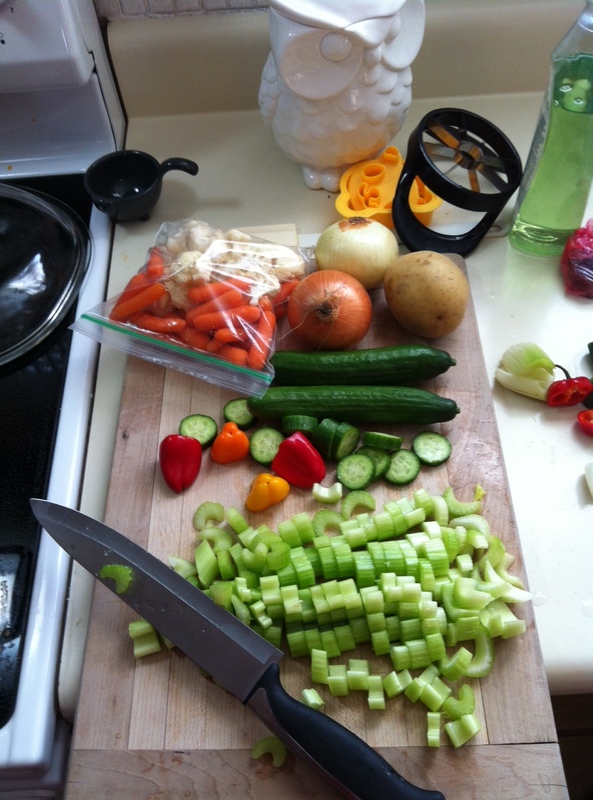 Chop up all your vegetables. 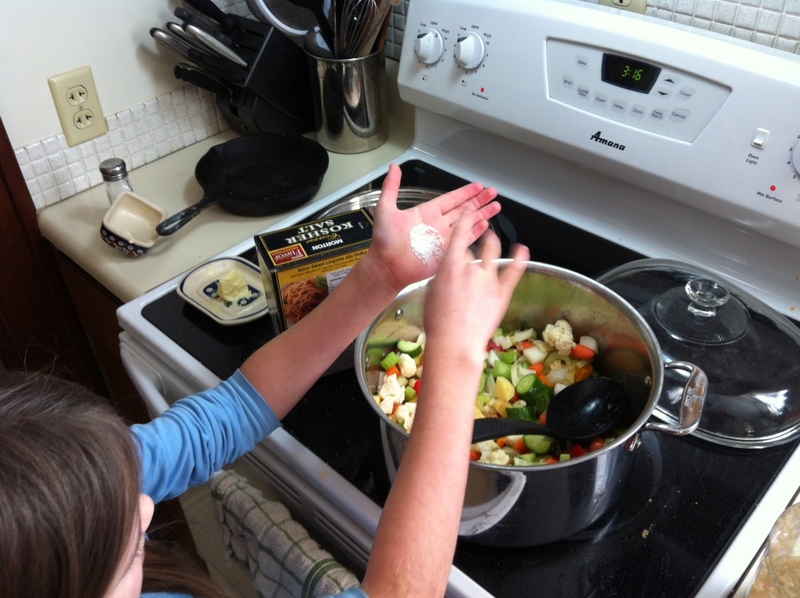 Melt two tablespoons of butter in an 8 quart pot and sauté vegetables until they begin to soften. While sautéing, add salt, pepper, minced garlic, and curry powder. 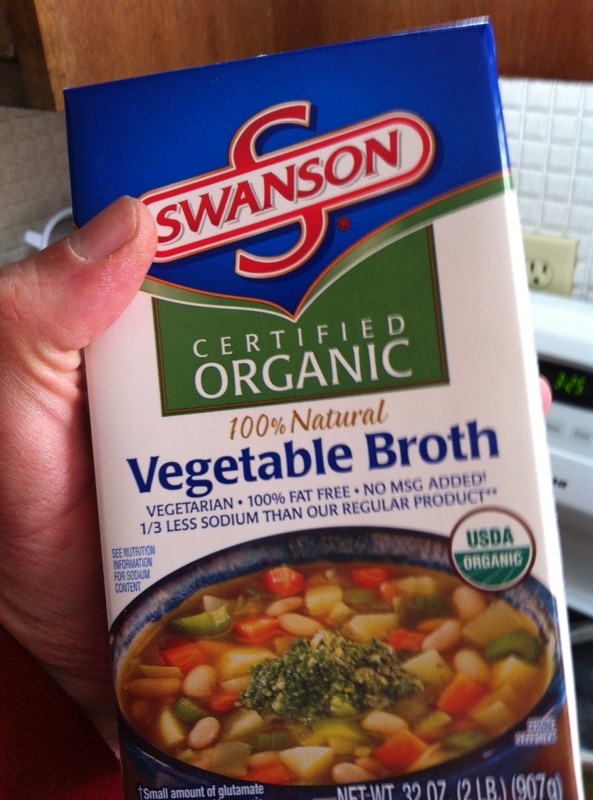 Once the vegetables have softened, and onions begin to become translucent, add whole 32 ounce container of broth. Bring soup to a boil, uncovered. Once boiling, reduce heat to low and allow to simmer covered for AT LEAST an hour, stirring occasionally. 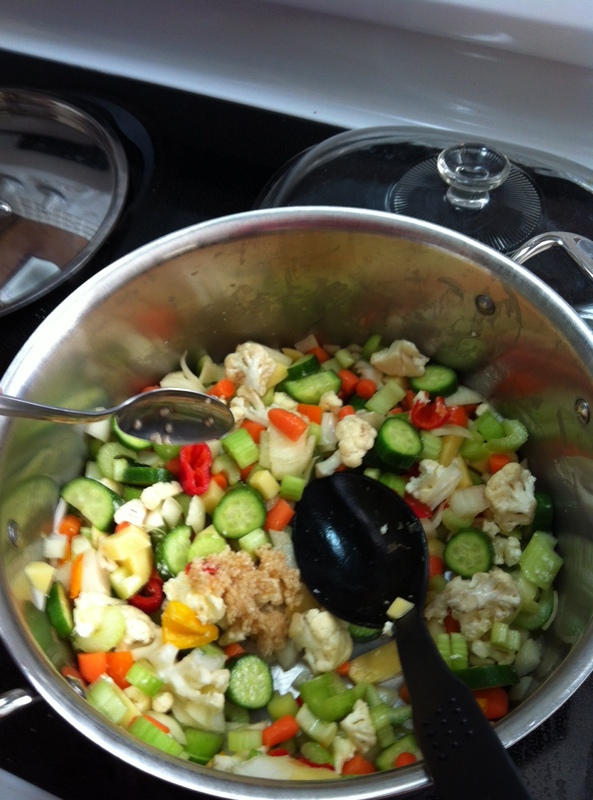 Once vegetables have softened, add 1 1/2 cups milk and stir. 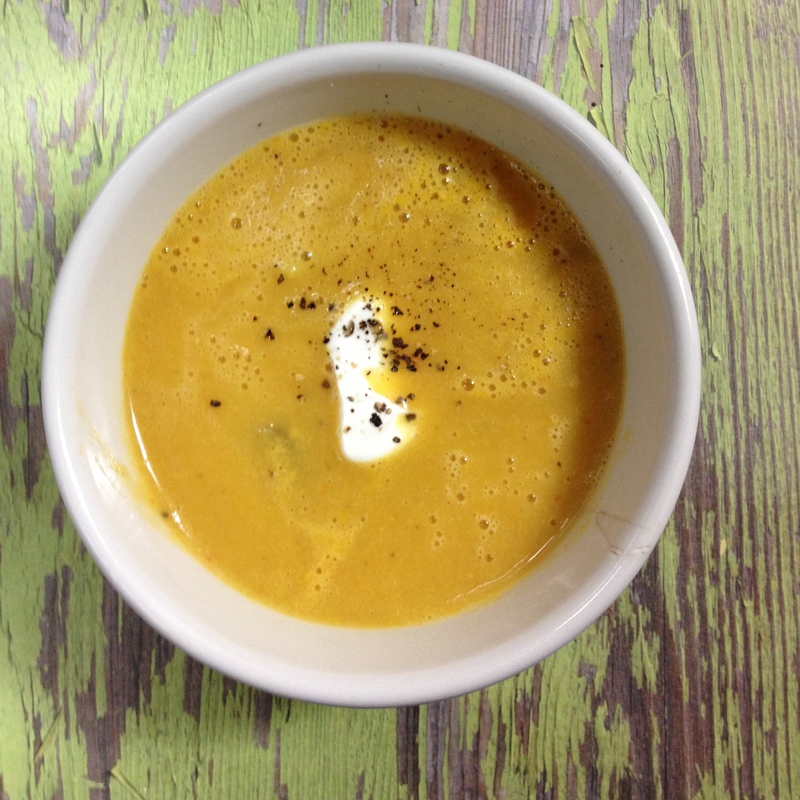 Once the milk has been stirred in, use the immersion blender and blend the heck out of it, until soup is creamy. There may still be a few rogue vegetable chunks, just don’t serve those to your persnickety child. The Lovely Wife and I had our 12th anniversary on Sunday. Nothing says “Happy Anniversary, I love you” quite like going to a restaurant that specializes in butchering its own meat. *Two thoughts on butchering. First, I am totally fascinated by the butchering process. When I was a kid, I helped my grandparents butcher hogs on their farm a couple of times. I think it is such an important and under-appreciated skill. I help out for a few hours each year cutting up pork for our church’s sausage supper, and I’m always amazed by some of the older gentlemen of our congregation who cut pork all day long. My hands are killing me after only two or three hours of work…then there’s guys in their 70s who butcher all day long. It kind of reminds me that my hands are generally used for typing and texting most of their days, and are not accustomed to actual WORK. Second, for those who are opposed to the eating of meat, and butchering animals, good for you, but here is my philosophy. Everything dies of something. Hogs, cattle, chicken and their tasty brethren serve an important and noble purpose. They fuel innovation and progress. Do I wish we raised our food more humanely in general? Absolutely. I really wish we could go back to more sustainable agriculture. But, with 7 billion mouths to feed, industrial agriculture is here to stay. And now back to our romantic anniversary…with our two children. Unfortunately, my Mom and Dad are out of town over Christmas. They are our go-to babysitters, and we really didn’t feel like trying to arrange a sitter, so we spent the day with our kiddos. Honestly, it was a blast. They’re kind of funny, loud reminders of all we’ve accomplished during our dozen years of wedded bliss. * We went to the Missouri Botanical Garden in the afternoon and had an awesome time together. I am constantly amazed at how awesome the Botanical Garden is all year round. *So, I was thinking about what to give the lovely wife for our anniversary. I started thinking about dozens. The first thing that popped into my head was eggs. Then doughnuts. Finally, my mother-in-law suggested a dozen roses. That thought had never crossed my mind. I am a true romantic. And on to the meal. It was not very busy on Sunday night, and we were seated right away. The space is open with wooden walls and metal chairs and tables. I especially enjoyed the large picture of heritage breed hogs to my left as I sat down. Our waitress was prompt with our beverages. I ordered a Boulevard Tank 7 Ale, and the lovely wife ordered a mixed drink. I’d never had Tank 7 before, and found it to be an excellent citrusy, hoppy beer. As it was still Christmas break, and I’m still off the reservation as far as health goes, we ordered an appetizer. Our waitress described the flatbread of the day as having prime rib with onions, peppers, cheddar, and their own steak sauce. You had me at prime rib. It came out cut into four generous strips. I loved it. The prime rib strips still had pink centers, and the onions and steak sauce provided sweetness to contrast the savory beef. As we are at a restaurant that butchers its own meat, I figured I couldn’t go wrong with the Butcher’s Cut on the menu. The cut of the day was a 12 ounce ribeye. I ordered it medium-rare, while Sarah ordered The Block Burger medium. As for the kids, Katie ordered buttered noodles, while Brendan ordered the mac and cheese. Interestingly, Katie was permitted to substitute spinach for the fries as her side. After a short wait, our food arrived. First, the burger. The lovely wife and I said we would split our dishes, so we would each get some steak and burger each. I am glad I decided to share. 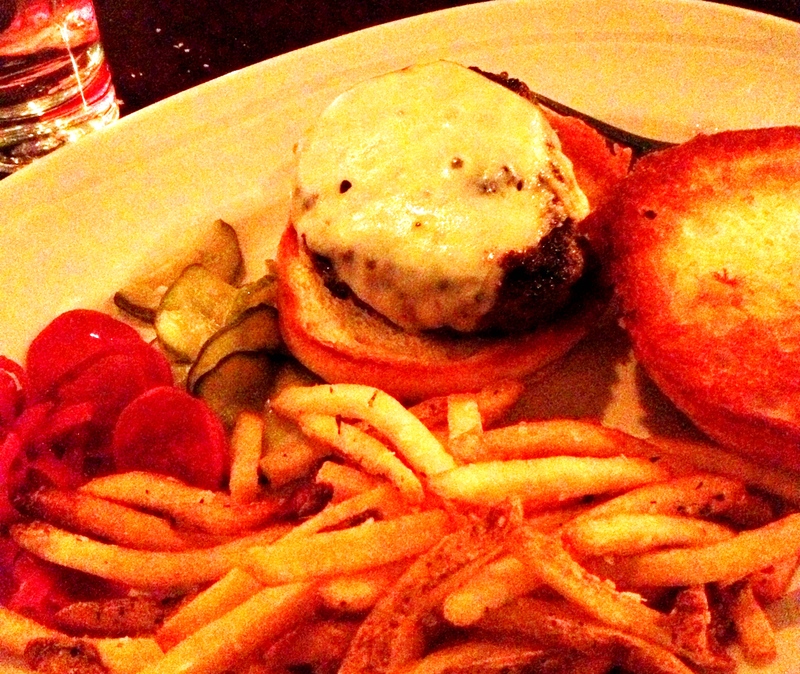 It was by far, the best burger I have had in St. Louis. Perfectly pink in the middle, each bite was full of well seasoned, melt in your mouth savory ground beef. Juices literally ran down my chin for the first couple of bites. The cheddar was very sharp, adding an extra burst of flavor, and the pickled onions and pickles complimented it all very well. I have to be honest, I don’t even recall the bun, the meat was that good. As for the steak, it was excellent as well. Ribeyes are my favorite steaks. A little fatty, lots of bold flavor. Once again, my steak was well seasoned, and cooked to a perfect medium-rare. My lovely wife couldn’t get enough of the steak sauce. It was excellent. 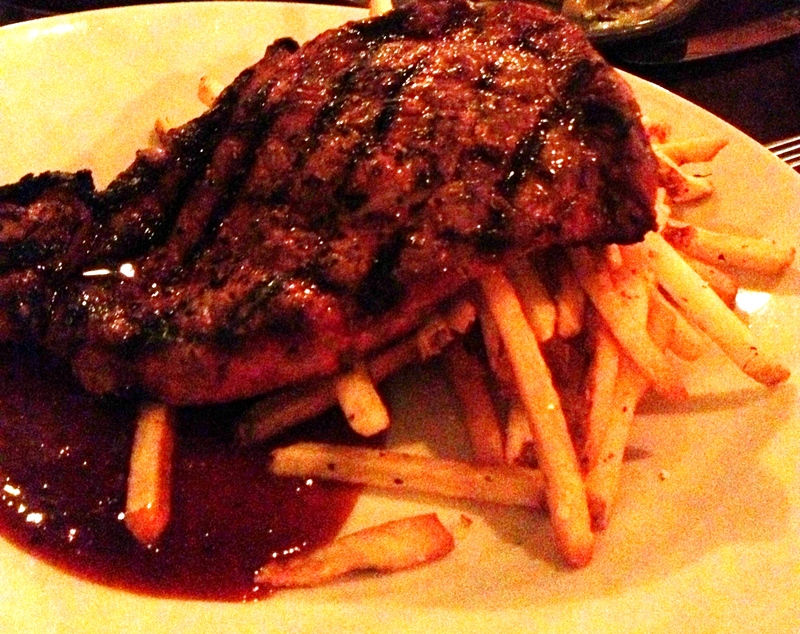 Sweeter than A1 and other sauces out there, the Block sauce was a great compliment to our steak (and fries). Speaking of the fries, they were fantastic as well. Well salted, with enough garlic flavor, but not overwhelming, as garlic fries tend to be. The wonderful daughter liked the buttered noodles, but didn’t care for the spinach. The delightful son liked the mac and cheese and fries. My daughter noticed the flavors of ice cream on the large chalkboard behind us early in our meal. It was all house made and had some intriguing flavors. As it was our anniversary, we decided to splurge on dessert as well. Each order comes with two scoops of ice cream. The kids split an order of farmhouse vanilla, while the lovely wife and I shared a bowl of CHOCOLATE BACON ICE CREAM. Sadly, my bacon intake will be greatly curtailed in 2013, but wow, I truly enjoyed the blessings of the Bacon Christmas Fairy over break. First off, the chocolate flavor in the ice cream was very intense. It was strong dark chocolate that had a deep complex flavor. It was almost a smoky flavor. Into that were chunks of delightful salted bacon. Cold, smoky, and salty it was a real treat. The lovely wife agreed it was some of the best ice cream we have had. One final note, as parents of a diabetic child, we really appreciate it when restaurants can give us accurate food measurements. When we asked our server the portion size of our daughter’s buttered noodles, she promptly returned and told us a serving was six ounces. It is a real help, and we appreciated the service with a smile. Overall, we all agreed it was a wonderful anniversary meal. We felt well taken care of, had amazing appetizers, marvelous main courses, and delicious desserts. It was a delightful end to our celebration of a dozen years of marriage. So, if you find yourselves in Webster Groves, drive around to The Block and meet some outstanding meat in the new year.